My sister, who is also organizationally challenged, recommended a professional organizer whom she had used before to help me with my “issues”. After putting it off for nearly a year because I just knew I would stumble upon THE system that would finally make everything make sense in my home; I hired her. She charged $25.00 an hour with a four hour minimum. She worked with me for four hours on Monday and is coming again Friday for four hours. She had me take her through the house showing her all my problem areas. I could have only done that with a stranger. She asked what my priorities were. She asked what our hobbies and interests were as a family. Then we went to work. I now have a Christmas closet that ONLY contains Christmas items. I now have a home decor closet so that when I want to change out seasons or colors I can do that. Our home only has a tiny linen closet, a tiny closet in the foyer, a walk in closet in my husband’s office, small closets in the other three bedrooms. The basement is unfinished but broken up into three rooms that have poles in the middle of them (I assume they are holding the house up so they are important) a sump pump hole in the floor of one of the basement rooms (good for those times it rains so much the water comes into the basement and needs to be funneled out not so good for looks or storage) and the furnace/water heater in the middle of another basement room. Not a good storage situation. Useful mostly for exercise equipment, DH’s workshop and extra acquarium supplies. My husband loves freshwater fish and what started out as one tank for our son is now nine tanks in various rooms in the house. We are down to our last child living at home, he is 12, so we will have an extra bedroom after his new room which is now the playroom is finished. Two of the three older kids that have “moved out” still have stuff left here at our home that if put altogether probably would fill all of the “open” space in one of the the basement rooms easily. Of course, it isn’t in one place it is in many places. She suggested that we gather up each boy’s stuff (when I say boys I mean men 28 and 24 who have been gone for 3 or 4 years) and put them in two separate areas of the house – one for each child- and tell them to come and get it by X date or the charity truck is coming to take it away ah ha. I don’t have a problem with this plan. My husband, on the other hand will. I’ve been trying to convince him of this for a l o n g time. My organizer is hoping that once he sees how much stuff each of them really has and how much space it actually takes up when accumulated in one space that he will see the light and make the call himself. Perhaps even offer to carry it out, perhaps even load it in his truck and perhaps even deliver it to them. I really don’t care how it gets gone, I just want it gone. Love them, not all their stuff. She also suggested that once our remaining son moves into the bigger bedroom (the room awaiting weatherproofing, new carpet and a new paint job) that instead of making his old room into a dedicated guest room that I turn it into my studio. My current studio is what is supposed to be the formal living room. It is very small and contains my piano, my library, my scrapbooking supplies, my rubberstamp supplies, my quilting supplies including fabric, my yarn for my crochet projects, our household files and bills as well as a small TV, a rocking chair, a small desk and a round side table with lamp. Itisveryverycrowded and really unusable with piles of stuff everywhere. That would leave the piano and my bookshelves plus the rocking chair and the side table with lamp in the formal living room. Our 11 year old could practice his trumpet in what would now be the music/library room. I had told the organizer that I always wanted to have a library because I love books and my mother has a library. It is always something I wished I could have but didn’t think I had the house for. I am actually receptive to this. I had been looking forward to having a real guest room so I’m not sure how I’ll feel about not having a designated “guest” room, but the studio could probably serve as a guest room with one of those inflatable beds or even a rented bed if you can rent beds for the time a guest would need it. Our 12 year old offered to let guests use his room if we needed to from time to time. We actually don’t ever have that many guests as the older boys live nearby. So her suggestions could work, if I get most of it done and then work on convincing DH that it is a good idea. That is the hardest part. Pray for me. I’m rather excited about this. I’ll keep you posted on what really happens. We purchased an inflatable bed which worked well for the guests we had over the summer. When we get DS moved to his new room, I think his old room could serve as a library/guestroom just fine. It would also be a good space for DS to practice his trumpet. It is snowing yet again. BIG, HEAVY, hard to walk in snow. The kids are out of school today so DS, the younger is having fun with a buddy. Our driveway has been shoveled twice thus far and if I hadn’t just told you that, you would have no clue. I’m really sleepy today, this is need a nap weather. We are supposed to have our portrait taken for the parish pictoral book tomorrow – the last day to get it done. I have no idea what we will wear. I’m thinking of seeing if our freebie can be a black and white image so that wouldn’t matter so much. We have new gold rams in our fish tank. I hope these survive. This is our fourth group. We also have lemon tetras, which I’ve been wanting but we’ve never found before. Parent teacher conference went great. I can’t believe he’ll be in middle school next year. Christopher Hitchens, I posted about him today as well. If anyone has a link to an article where a christian, preferably a catholic christian, effectively debates him, I would love to read it so puhleese let me know. I lost this week so I remain in the black at TOPS thus far. Yeah! 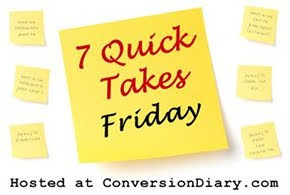 To read other Quick Takes, go see Jen at Conversion Diary. OMG Go Check Out This Cool Site, It Has Gobs of Very Well Done Printables! Seriously! Free Printable Calendars : Free Printables : Print : Printable Online : Chart Jungle. 1. Glad to be back. 2. Been listening to books on tape from the library and enjoying it very much. I listen to one upstairs and one in the car. As long as no one messes with the buttons, everything is okay. 3. DH has been uber busy. I am trying to pick up some of the slack of things he does around our home but we keep falling behind. 4. Going to training on the changes in the Mass Saturday morning. 5. It snowed again today. Enough to shovel and make the roads messy. DS will enjoy getting to play in it in the morning. 6. I’ve been enjoying getting back into rubber stamping and scrapbooking. Figuring out what I like and don’t like is a big part of it. That whole process can be overwhelming and I think I felt stuck because I didn’t have MY vision. Now I do so this should be fun. 7. Had a heady conversation with 11 year old DS. Let’s just say that it was all physics related and he knew what he was talking about and I had no clue. I had to come home and google words he used. It took me about three hours to calm down after him talking to me for two solid hours about all these ideas and theories that he had, that he had read about or that he had discussed with his tennis coach. He’s done this before, but not with this intensity. Gotta figure out how to nurture that passion. Head to Conversion Diary for other Quick Takes. I’ve been so busy with LIFE that I had stepped away from my blog and reading blogs in general. I’ve just recently started reading favorites again which, of course, leads to finding new favorites and I am loving it although it does eat into my time for personal Bible study, personal prayer, housework, and crafting. I feel, however, that I am being enriched in so many ways by “meeting” such cool people via their blogs. Something I would, in no way, have time for IRL. So, I’ve been subscribing to blogs via Google Reader – please everyone get this subscription tool! I’ve also used the Press This feature to link to posts that have impacted me in one way or the other. Right now, they look pretty bland and I’ll have to figure out some way to liven them up, however things are being placed in one place which is one of the main purposes for my blog. Anyway, this works for me right now and I am thrilled to be back. Getting up early http://frugalcrunchychristy.blogspot.com/2009/09/getting-up-early.html this blogger is Catholic and regnum christi. I need to read more on her blog.